Robert and Janet came to Cosmic requiring a modern website for their new organisation, Working Well With Autism. They needed a website which would cater for all types of browsers and devices, as well as having the ability to post news articles and upcoming events. Who are Working Well With Autism? 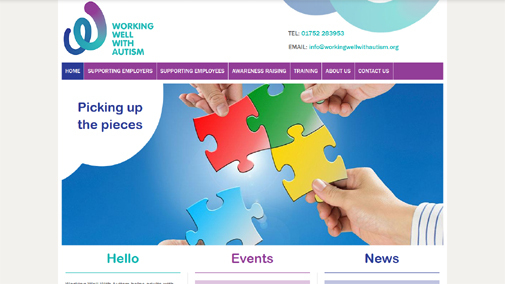 "Working Well With Autism is a not-for-profit co-operative enterprise dedicated to improving the working and student lives of adults with autism in higher education and the workplace through support, training and consultancy. Its founders, husband-and-wife team Janet Wise and Rob de Jong, have been active within the Voluntary and Community Sector (VCS) and social enterprise world for many years, campaigning tirelessly for the right of disabled people and their carers to be heard, recognised and fully included in society. They are also parents of a teenage son on the autism spectrum, and feel they have been on the autism journey of discovery forever."